Four years and two months ago, I walked into the KOM Marshall office. Basically, there was a desk, a computer, and a chair. I was the new Program Manager for the office, and I was excited and a bit bewildered about what to do. I had served my previous years in pastoral ministry, and there was a need to educate myself about the Karen and the challenges they were facing. I was happy to be part of the effort to ensure a safe and comfortable ‘landing’ for the Karen in Marshall and anticipated serving them. There was a case manager who had been hired shortly before me, and we began our journey together to get to know the Karen, to educate them about the US bureaucratic intricacies, and to educate me about their varied paths to southwest Minnesota. Within four months of my arrival, the case manager resigned and moved to the Cities. That started a rather long effort to recruit someone from the Karen community to take over the Case Manager’s position. Eventually, Mu Hser joined the team and we worked together until this month: January, 2019. Upon hearing that the Marshall KOM office was going to be closed, she resigned and I was left with helping those who needed help and closing the office. That amounted to releasing a letter from the home office about why the Marshall office was closing, contacting many partners and canceling future planned programs. From a personal perspective, I learned a lot about the Karen culture and how to help them become active and participating members of our society. That meant helping with anything from medical issues, immigration matters, transportation, English and citizenship classes, home buying courses, healthy lifestyles initiatives, and educational and economic opportunities. We could have used a full time case manager from the start. I partnered with almost every social agency in this area and am proud of that effort. Our efforts have led local Karen to gain employment, citizenship, education, state wide recognition (i.e. 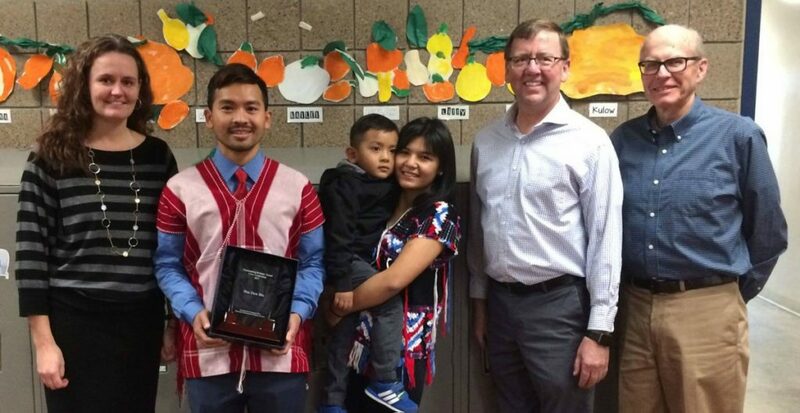 Outstanding Refugee Award for Hsa Daw Mu), and generally a larger awareness within the Marshall area of the Karen and their positive qualities. Personally, I believe we did what we were supposed to do; for that, all of KOM should be proud. This opportunity has taught me many things about a new culture and the wonderful people of that culture. For that, I am eternally grateful. Because I sincerely believe in the goodness of all people and the need for all of us to work together for the common good, it’s hard for me to walk away from this office.